Pity, if you can, poor Ivanka Trump. She is not literally poor, of course. No, the born-rich socialite-turned-international-ambassador and daughter of the living embodiment of late capitalism is poor only in social currency. Once hailed as a possible stabilizing influence on her father, a racist man whose brain is broken, she is now reduced to merely giving vague, conflicting statements, like her support of Oprah’s anti-Trump Golden Globes speech, and appearing in carefully staged video and photo ops, 100 percent of which look like generic stock photos. Yesterday Trump took a tour of an educational facility as an ostensible representative of her father’s infrastructure initiatives. In the above photo, she is not in fact cosplaying as her favorite playable character from the board game Pandemic, but instead measuring the nicotine levels in vape juice. This is funny in and of itself, because vaping is funny, but moreover the image of Trump now pretending to be a scientist in a pretty transparently staged photo-op only adds to the ridiculousness of her slate of duties as unelected “special advisor” to the president. Anyway, the pursed lips, perfectly manicured hair, and stereotypical “scientist” pose all make for a compelling image, and you already know what happened to it: The same thing that happens to any image in the year of our lord 2018. Certainly, you understand how this works by now; there are many, many more examples on Twitter. 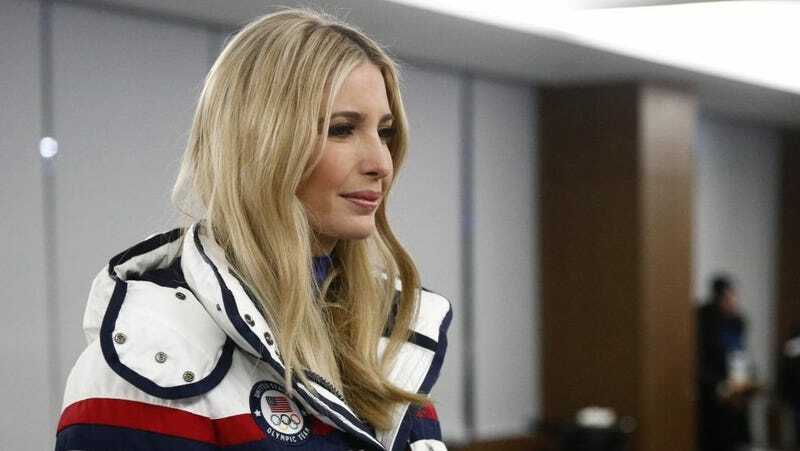 Mostly, it’s just further proof of the Trump scion’s status as a walking PR apparatus for her father, pretending to be the ambassador for a functioning administration just as much as she is pretending to be a scientist. It’s all fun make-believe for people who have never worked a day in their lives.